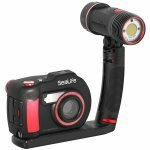 Combined with the new Sea Dragon 3000 Auto Light and the DC2000 underwater camera, the DC2000 Pro Light will capture vibrant underwater colors that are typically muted and color-less. The sun-like Sea Dragon 3000 Auto will make stills and videos extraordinary. The set includes Flex-Connect® Single Tray, Grip, Sea Dragon 3000 Auto light, and DC2000 underwater camera. 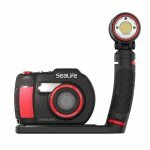 Combined with the sun-like Sea Dragon 3000F Light, the DC2000 Pro Light set will capture vibrant underwater colors with a wide and even beam angle. The new DC2000 features a large SONY® 1” type back-illuminated 20MP image sensor, full manual control, 1080p HD video, and RAW formatting capabilities, allowing you to explore new creative depths. The Sea Dragon 3000F light, Flex-Connect Single Tray, and Grip quickly attaches to the DC2000. The set is depth rated down to 330ft/100m. Featuring a Color Rendering Index of 80 and color temperature 5000k, the Sea Dragon 3000F simulates natural sunlight bringing out stunning colors in underwater stills and videos. The incredibly wide 120-degree beam (90-degrees underwater) of the Sea Dragon 3000F ensures maximum lighting coverage and is ideal for cameras with a wide field of view. With a lab verified lumen output of 3000, the light has a 60 minute burn time at full power - making it incredibly efficient as well as bright. The Sea Dragon 3000 brightness can be adjusted manually or automatically with its built-in photocell light sensor. The Auto Bright mode automatically adjusts from 300 to 3000 lumens based on proximity to the subject, helping to preserve your eye’s natural night vision and extending battery life. The light can also be manually adjusted to 100%, 50% or 25% brightness. Two integrated 180-lumen red LED’s cast an 88° beam and preserve your eye’s own natural night vision and allow divers close encounters to certain nighttime sea creatures that swim away from bright lights. The red LED’s are powerful enough to assist the camera’s auto focus and will turn off for 1 second when a Strobe/Flash is fired. Quickly and easily expand your camera set with Flex-Connect - add grips, Flex Arms, trays and other accessories with just a "click!" 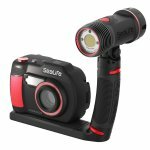 Flex-Connect allows you to transform your camera set from compact to full-featured in just seconds, providing a quick way to adjust to any dive environment. Constant brightness - Regulated circuitry so light won’t dim with battery power. 80 Color Rendering Index (CRI) that mimics natural daylight.